On the occasion of the 49th Commemoration Day of Late Harinarayan Barua, the founder of Village Defence Force in Assam, a dedicated Village Defence Party (VDP) flying squad was formed under the Jorhat Police Station consisting of five members of VDP on Thursday. 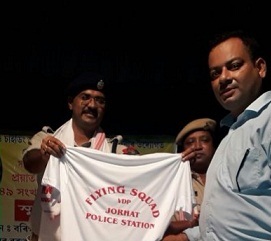 This is a one-of-its kind initiative of Jorhat Police. The Jorhat Superintendent of Police (SP) Vaibhav Nimbalkar said that they would be performing their duties on motorbikes by executing mobile patrolling on special occasions like festivals, responding to emergencies and other duties as and when required under the command and control of the Officer In-Charge (OC) of Jorhat Police Station and Commanding Officer of the Village Defence Organisation (VDO) of Jorhat Police Station. Nimbalkar further said that they were all part of VDP of Jorhat Police Station (all young VDPs) who would patrol on special occasions in Jorhat Police Station areas. The website of the Assam Police states that the Village Defence Organisation is a concept and organisation unique to the State of Assam. It was established in the year 1949 when Late Harinarayan Baruah, the founder of the organisation, set up a team of village youths to look after and safeguard their own village. This concept of looking after the security of one’s own village gradually spread into neighbouring districts and soon an organisation which came to be known as the Village Defence Organisation came into being. It soon earned, through the unflinching hard work and sincerity of its founder and the workers, the recognition and sanction of the Government. An Act was enacted known as the Village Defence Organisation Act in 1966, followed by the Assam Village Defence Rules in 1986, both of which govern the functioning of the organisation. The principal objective of the VDO is to assist the police in the maintenance of law and order, peace and tranquility in the State. The Director General of Police (DGP) is the head of the organisation.